Sam Pilling, Account Manager and Robert Ratcliffe, Business Development Officer from New Directions Education attended the Association of School and College Leaders (ASCL) conference last week at Venue Cymru Llandudno. 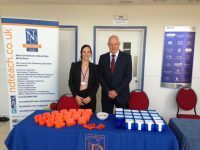 The conference was an opportunity for members of ASCL involved in the North Wales Education sector to meet and discuss pertinent topics. The conference this year focused on qualification reform and qualification and the Welsh Baccalaureate.